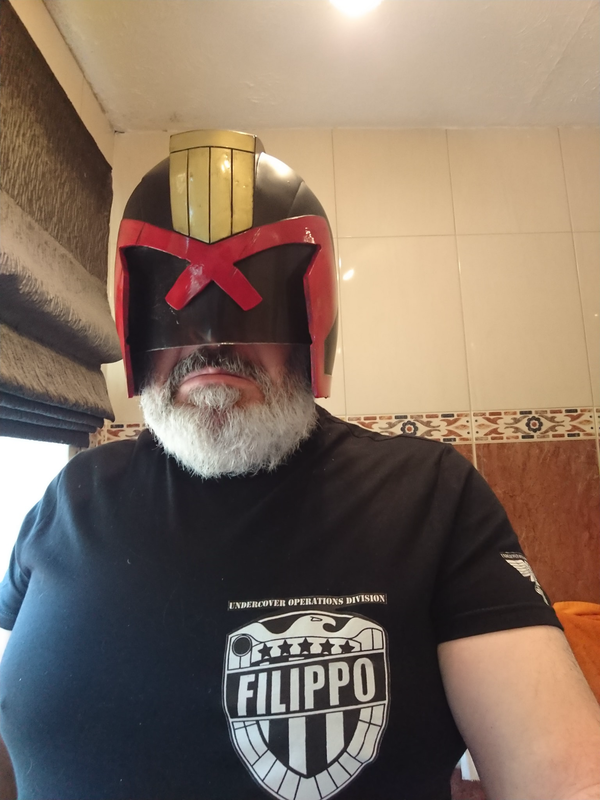 First Lawgiver, and as I know only a few of you I'll be wearing this t-shirt, please feel free to come and say hello. Just packing a few things to get signed then heading for my train. See you all later! Chuff, Filippo- where's that beard come from? Pink chit sorted. Tickets sorted. 1 more sleep to go!!!!!!!!!! First convention in a looooooooooooooooong time. We need a 'bouncing up and down in excited anticipation' emoji! What a day. First I couldn’t find my ticket (but I’ve got some proof of purchase so hopefully shouldn’t be a problem) then I missed my direct train cos there were two trains at same platform and I got on wrong one. Things can only get better! See you there folks. No Judge Pal this time (too fat), but hoping to display a couple of my models. Wish I was going. (Work providing, hopefully next year.) Have fun everyone! Well, I’ve had a lovely weekend with a great many fabulous people. The highlight, however, was when a very sober Dandontdare swallowed a fly and vomited on a passing lady. I did not vomit on a lady, there was possibly a speck of wind-propelled splashback, but in my defense it was a very windy day and a huge bluebottle that shot straight into the back of my throat. I'm gagging at the memory. That aside it was a great day, some fantastic costumes and who knew Ian Gibson was so funny? I sadly didn't catch a single panel while manning the table/taking photos. It seemed a lot busier than the last one - could possibly even stretch to a 2-dayer with a couple of extra panels. We worried about filling the space we had, but combined with Planet Replicas table and Lee Carter, Paul Williams and Dan Cornwell shifted from the main artist bit we needn't had worried. Apart from the odd lull when people went into panels it was very busy, and Dan from Planet Replicas said he did well out of it. I think they've reached the limits of what they could get in there - there was a dealers room that could have had a couple of artists which thankfully had open windows. Shame that Rebellion have decided on squashing it in that form, but offer no official alternative - any suggestion after the 40th of doing something every year was met with a 'not likely'. There's obviously a market for something like this, and encourages interest in what is a niche area compared to the US/Media side. Fair play to the organisers for finding a way around it and going ahead with an alternative in whatever form it takes.